Fourteen women met at Muriel and Karen Marston’s. Their recent work on the house makes the place just glow. Margaret Wentworth led the program and devotions on the theme “God Speaks Through Others.” The author of the lesson in our Blueprints quoted Psalm 46: “As the deer panteth for water, so my soul panteth for you, oh God.” We shared how God can speak to us through others or in ways we might not recognize. cheesecake. Angie and her team will provide the May meal. We are asked to pray for all Friends attending the Friends World Committee for Consultation world conference in Kenya. 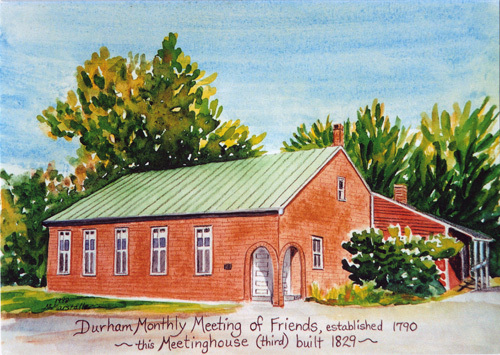 We planned details of the NE USFW meeting to be held at the meetinghouse on May 12 and the Yard Sale on May 26 (see related articles!). In closing our meeting, we held in prayer all those who could not join us for the evening. We enjoyed Karen’s fabulous refreshments, the antics of their dog, and each other’s company before heading into the night. Our next meeting will be Monday, May 21, at Nancy’s house, with Angie leading devotions and Dot Hinshaw leading the program. Hope you can come!